If you’ve ever crooned along to Procol Harem’s “Whiter Shade of Pale,” you might remember the line about the “sixteen vestal virgins.” Probably, you happily sang along without a clue as to what “vestal” really means. In ancient Rome, “vestals” were priestesses of the goddess Vesta, who was the goddess of the hearth. Her priestesses attended an eternal flame that was never allowed to go out. These attendants took vows of chastity and devoted themselves to religious tasks that were off limits to priests and other men. Vestal virgins could be easily identified by their elaborate hairstyles composed of six intricate braids which were artistically wrapped around the head. A few years ago, professional stylist and amateur archaeologist Janet Stephens became interested in just how the hairstyles were physically possible. She practiced on dozens of mannequin heads, but despite her laborious attempts, none could hold the shape for very long. She ensconced herself in college research libraries, looking at everything she could find about hairstyles of ancient Roman women. As she soon discovered, until very recently, most scholarship has been conducted by men who had little interest in the fashions of women other than the very elite, and even that was scarce. For seven years, Stephens came up empty handed in her research and frustrated as she continued her attempts at re-creation on mannequins. Until one day, she happened upon a little fragment of a mention from an scholar who had been writing several hundred years prior. This scholar mentioned a long needle that was made for both embroidery and for sewing of hairstyles. With a little more detective work, Stephens was able to track down the type of embroidery needle. Excited, she tried it on her wigged heads and voila! It worked! 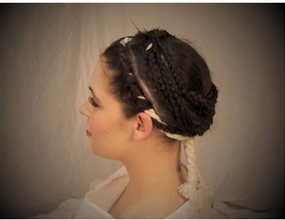 First, Stephens found, the Vestal’s hair would be separated into sections, each of which would be braided into six separate braids, including a pair of cornrow braids that ran flat across the head above the ears. The hair around the hairline would then be wrapped around a cord, which would then be tied at the nape of the neck. Leftover loose hair from around the face would then be weaved into a final, seventh braid. The entire process takes about 35-40 minutes, but Stephen feels that two slaves were probably able to do so in about ten minutes. Interestingly, she also discovered that only women with waist-length hair had enough hair to achieve the style. 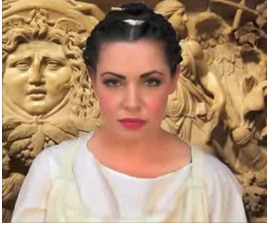 Check out Janet Stephen’s YouTube channel to watch her fascinating work on the “vestals” and many other ancient hairstyles. That sounds too complicated, but very interesting and certainly distinctive to set the vestals apart. Must remember not to let our 9 year old see this or she’ll want a reinactment. As for the song, at least now I have an image of what they may have looked like. Thank you!